No lenses or focusing needed. Just download the image file. Print it out full size on a single sheet of transparency film. Use a hobby knife to cut out the 2 shapes. Carefully cut the slits as shown and use a small-size (⅛” hole) paper punch to make the little circles to provide stress relief at the inside corners. Score on the dashed fold lines by tracing over them with a ballpoint pen and straightedge. Then fold as shown. The sides fold forward and interlock. Fold the bottom backward and bend the 2 wings up and tape together at A and B. Thread an unbroken pair of takeout chopsticks through the square holes. 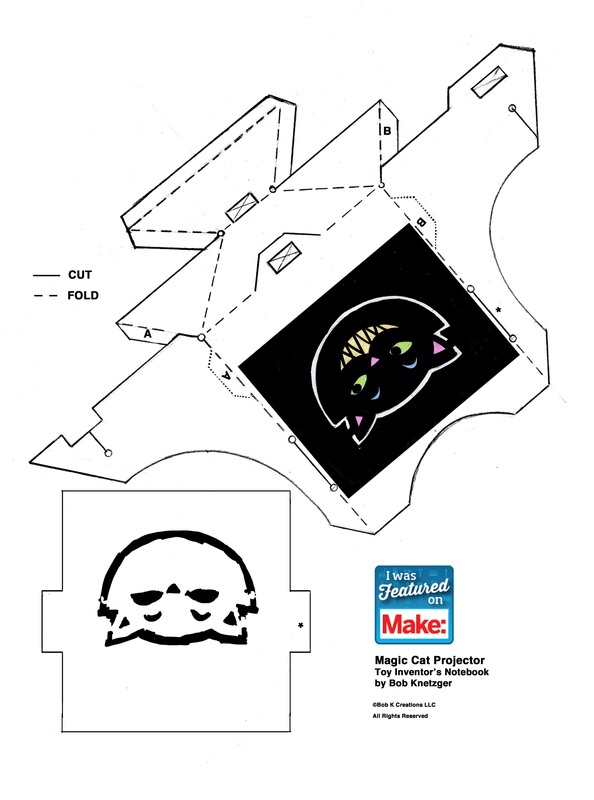 Insert the tabs of the second shape into the slits, matching the asterisk on the first shape. It should freely slide up and down in the slits. Solder the 2 leads from a four-AAA battery pack to the contacts of a PR13 flashlight bulb. The battery box I used had a built in on/off switch. If yours doesn’t, just take the batteries out to turn it off. Hot-glue the battery box to the other end of the chopsticks. Hot-glue the light bulb to the chopsticks and to the backside of the battery box. 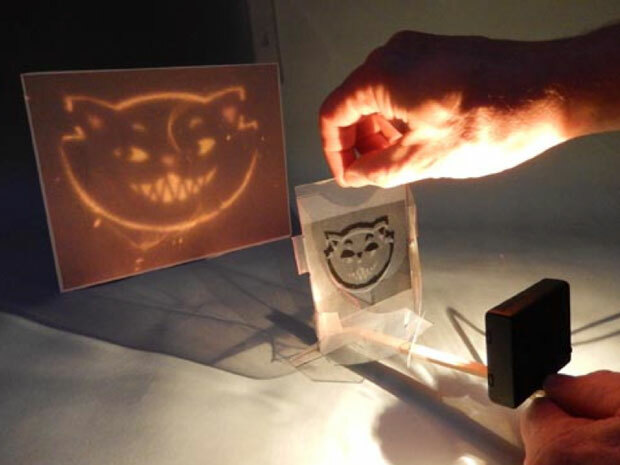 Dim the lights and slide the film up and down to make the cat disappear and reappear! Feeling ambitious? Take the project to the next level by adding a small motor and cam to automate the effect into a free-running display. Or replace the flimsy film with some laser-cut fiberboard (first add some bridges and a frame to the isolated image “islands” so it all holds together.) Happy Halloween! Download and print out the pattern on transparency film. Solder the battery box leads to the bulb and test. Cut out the two transparency parts on the solid lines. Cut out the square holes. Punch out the corner stress relief circles with a small hand punch. Use a ballpoint pen to draw over and score the dashed folding lines. An old used up and dry pen is perfect for this. Fold on the dashed lines. Fold and bend the big sidepieces to the front. Fold and bend the bottom up. Bend the small tabs back and the side triangles up. Tape the folded tabs over the edges at each side. Bend and fold the three strips along the foot. Insert the two slots together on the front pieces. Insert the tabs on the second sliding piece into the slits on the main part. Match up the “L”s. Insert the chopstick through the three square holes along the bottom. Here is the final stick assembly. The wide part of the chopsticks are at the rear. Hot glue the battery box to the other end of the chopsticks. Hot glue the bulb just behind the battery box. The battery box acts as a shield to block the light from the bulb from shining forward. Hold the chopsticks with one hand as you grasp the top of the slider with your other hand. 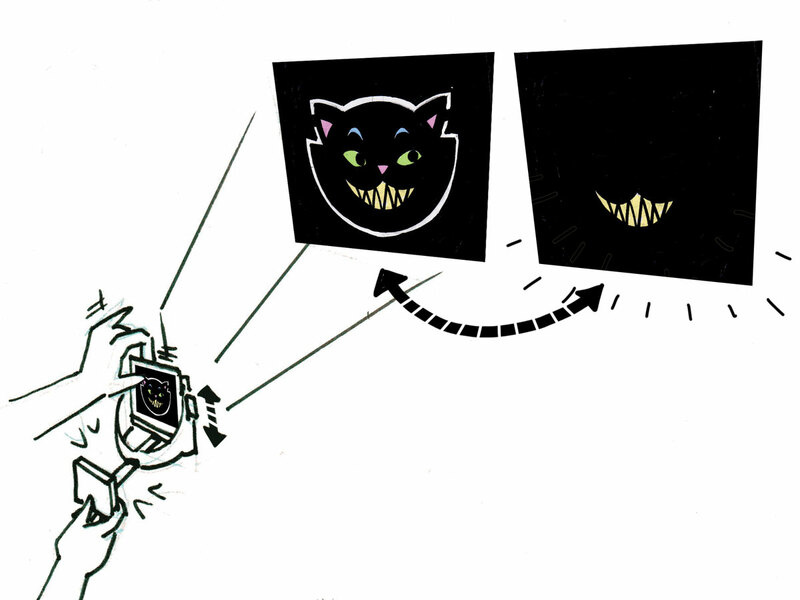 Move it up and down to make the grinning cat appear and disappear.